Here are some frequently asked questions about our discount prescription drug plan. Please feel free to contact us with questions via phone or email. I have received multiple cards in the mail - what should I do with the additional cards? A: The additional cards can be given to friends, family, coworkers or anyone who may benefit from prescription savings. A: Simply present the card to a participating pharmacist when filling your prescription and you will receive the lowest price available. How many times can I use this card? A: The AgilityRx card has unlimited usage and never expires. Are there any fees to the AgilityRx member? A: There are no enrollment/activation, monthly, annual or usage fees. 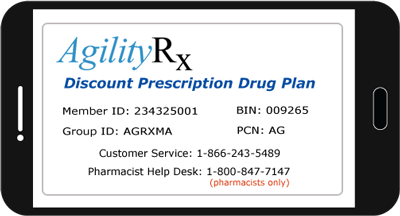 With so many discount prescription drug cards out there, why should I use the AgilityRx card? A: AgilityRx members benefit from some of the industries richest discounts, and the AgilityRx card is commonly accepted nationwide. Can I use this card when traveling or on vacation? A: Of course, you can use this card at participating pharmacies nationwide. You can also use the AgilityRx card in Puerto Rico, Guam, and the Virgin Islands. Does my doctor need to know I will use my AgilityRx card when writing my prescription? A: No. The AgilityRx plan will not affect the way you are cared for by your physician. However, it would be to your advantage to always consult with your doctor about saving money on prescription medications. A: Members can save up to 20% on many brand medications and up to 75% on many generic medications. A: Anyone and everyone can benefit from using the AgilityRx card. A: There are no age restrictions. Everyone can benefit from using the AgilityRx card. I am not a US citizen, can I still benefit from using this card? A: Absolutely. You do not need to be a US citizen to receive discounts using the AgilityRx card. I already have insurance that covers my prescription medication. How can the AgilityRx card benefit me? A: The AgilityRx card can be used to obtain savings on prescription drugs that are excluded by your current plan or are not included because you have exceeded your plan's maximum limits. In some instances, you may find the AgilityRx prices are lower than your plan's out-of-pocket amount/co-payment. Does every member of my family need a card? Or can they use mine? What medications are included in this plan? A: All FDA approved brand and generic prescription drugs are included. How can I locate a pharmacy that offers the lowest-prices for my prescription drugs? A: Our innovative online pharmacy tools will locate participating pharmacies as well as which pharmacies offer the lowest prices for your prescription drugs by zip code. Can I figure out how much my prescription medication will cost before going to the pharmacist? I just picked up my refill prescription and the pills look different, what should I do? A: Often times there are many manufacturers producing the same generic drug. Contact your doctor or pharmacist to verify your prescription is correct. Our Online Pharmacy Tools provide various images of prescription drugs. Simply search for you prescription and click on the camera button to see an actual image. Do I need to fill out any claims or paperwork when using the Agility Rx card? A: Absolutely not; no claim forms or paperwork are required. Discounts are instant, automatic, and processed electronically. What pharmacies will accept this card? I cannot locate my preferred pharmacy on the web tools. I am at the pharmacy and forgot my card; can I still get my prescription drugs at a discounted price? A: Absolutely. Please call our customer service number and one of our representatives will assist you with immediate savings over the phone. I did not receive a discount when I went to the pharmacy. How did this happen? A: The Agility Rx card user will never be disadvantaged. You will pay the lower or “best” price available, whether the pharmacy’s price is lower or the Agility Rx card’s discounted price is lower. Is the Agility Rx card a form of insurance? A: No, Agility Rx discount prescription drug plan is not insurance. Is the Agility Rx card part of Medicare Part D? A: No, Agility Rx card is not part of Medicare Part D, however, our card can be very useful for someone in the “doughnut hole” of Medicare Part D.
I lost my Agility Rx card. How can I replace it? I know someone who can benefit from this card, how can they get a card? I know a group of people who can benefit from this card, how can they get a card? A: Please call our toll free customer service number 1-866-243-5489 and a representative will be happy to assist you. What if I have additional questions, who should I contact? Can I fill my pet prescription at one of your participating retail pharmacies? A: Yes, most of the AgilityRx participating pharmacies will fill your pet's prescription at the same great discounts provided to you and your family members. Is this the same medication that I would get from my vet? A: Yes, retail pharmacies have always offered many medications for pets. Numerous prescription medications for pets are the same as human medications, just different doses and strengths. Do I a need a prescription from my vet? A: Most medicines require a prescription from your vet. Plan to ask your vet if a prescription is required and if it can be filled at my local Pharmacy.